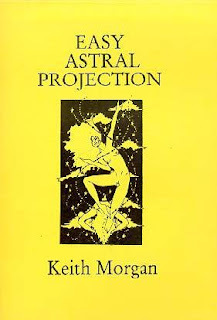 This time I'm reviewing the book Easy Astral Projection by Keith Morgan. This is a small book: Just 21 pages. The font is small but so are the margins, so there's not a lot of content. Its copyright is 1992, so it's not ancient. Although it doesn't say it on the cover, the subtitle is "Simple techniques for travelling in the Astral planes." I've read so many books that claim to make astral projection "Easy" or "Simple" that I've become a bit cynical about it. Inducing OBE has always been a long process for me, and never easy, so it makes me feel like they're luring me in, and I'm always disappointed. Yes, OBEs involve a kind of trance state, but to me it's completely different from a hypnotic trance. Early in this book, the author starts using the term "magick" and "magickal" as if to give out-of-body experience some kind of special 'occult' mystique. In my opinion, there's nothing magical about it. It happens to common folks every day. So let's talk about the author's OBE techniques. They're not bad and not without merit. They are, however, a bit obfuscated. I'm sorry, but in my opinion, scrying is a lot different from astral projection. In my opinion, with astral projection your physical body is just another inanimate object in the bedroom, and your awareness is elsewhere. With scrying, your consciousness stays firmly planted in the physical and you're using your mind's eye to do something akin to remote viewing. If you want to do remote viewing, there are plenty of good books about it. If you want to do scrying, there are good books on that, too. For example, Donald Tyson's book "Scrying For Beginners". But in my opinion, OBEs are not the same. There's another separate section of OBE techniques called "Astral Projection & Altered Consciousness Methods." It's small and unimpressive. It talks briefly about relaxation, slowing down your heart rate (and breathing), energizing the pineal gland and chakras, using a mirror, fasting and auto-suggestion. It's scant and not very detailed. "The Void is the primal void of chaos, that is DAATH on the Cabbalistic tree of Life, out of the turmoil of the firmament all is born, it is a start & a re-birth. Few authors have written about "The Void" but this is the only one I can recall that's negative. It seemed like needless negative superstition to me. Frederick Aardema's excellent book, Explorations In Consciousness has an excellent discussion of the Void, without the occult and/or kabbalistic connotations, and it's certainly not negative. This book's grammar is poor and careless (as you can see from the quotes above). The content is small and often obscure and veiled in occult labels. And in my opinion, the information isn't very good. Although the book is cheap, there are a lot of better OBE books out there. I'd pass on this one. Click here for a complete list of all my OBE book reviews. Great review. I recently found your blog and I'm so happy I did. I have read every post and I also love your book. Thanks for digging through these obscure OBE books. What Should I do When the Vibrations Hit?